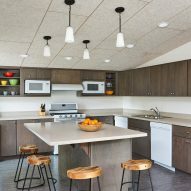 Tiny homes, an apartment building and a boarding house make up the Virginia Placer development, which Charles Cunniffe Architects has designed for a Rocky Mountain community in Colorado with a dearth of low-cost housing. 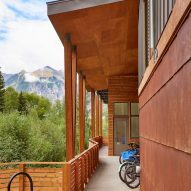 The Virginia Placer development is located in Telluride, a popular resort town ringed by forests and snow-capped peaks. Funded by the local government, the project was conceived in response to the area's shortage of affordable housing. 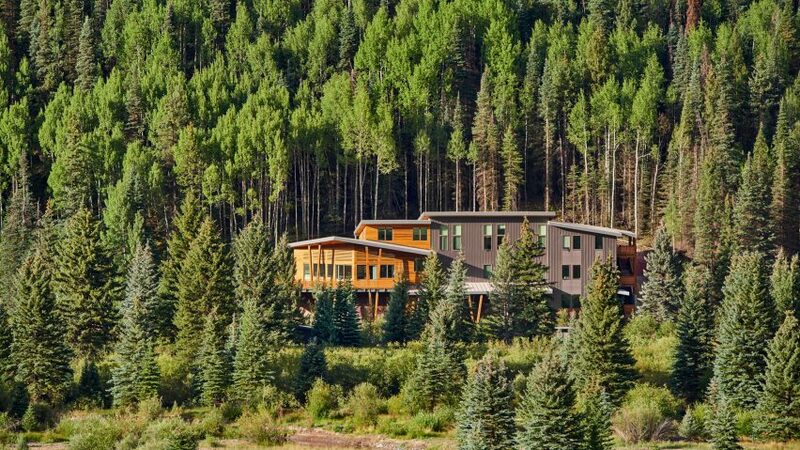 While hotel rooms and expensive vacation homes are plentiful, Telluride – like other Colorado resort towns – lacks housing options for low- to moderate-income residents. Workers at ski parks, restaurants, shops and other tourist-oriented venues are often forced to live far outside of town, where costs are lower. 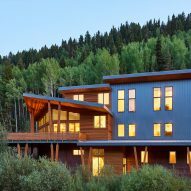 Designed by Aspen firm Charles Cunniffe Architects (CCA), the Virginia Placer development – named after an historic land owner and a mining term – consists of two buildings and three tiny homes, all situated along a small road just outside of Telluride's central village. One building serves as a boarding house with beds for 46 tenants, while the other contains 18 traditional apartments. The standalone micro homes each have a single room with a sleeping loft. All tenants are provided storage lockers for ski gear. Situated at the base of a mountain, the buildings rise up from slender parcels that line a curving road. The apartment building and boarding house – both three storeys – have a similar aesthetic. 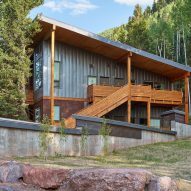 For the street-facing elevations, the team created staggered facades wrapped in varying types of metal, including standing-seam panels and weathering steel. Sloped roofs with deep overhangs help protect the buildings from the elements, including large amounts of snowfall. Timber balconies and open-air stairwells protrude from the apartment building, adding a sense of energy and movement. In lieu of balconies, the boarding house has a generous wooden deck that is partly sheltered by an angular canopy. 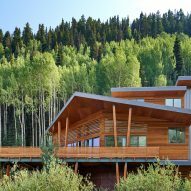 The deck "provides arguably the best mountain views in Telluride", according to the firm. Encompassing 9,600 square feet (892 square metres), the boarding house offers 18 rooms with single beds, and 14 rooms with bunk beds. Communal spaces include lounges, two kitchens and bathrooms. Totalling 14,427 square feet (1,340 square metres), the apartment building encompasses studios and two-bedroom units ranging from 407 to 837 square feet (38 to 78 square metres). "The apartments include oversized windows to allow passive solar and ventilation, outdoor decks, and high ceilings for maximum livability," said CCA. Interior finishes include white-painted drywall, concrete and vinyl-composite flooring, and reclaimed wood accents. Acoustic panels in the boarding house help with sound attenuation. Across the street from the boarding house are the micro dwellings, which are clad in corrugated metal and warm-toned cedar. The interiors feature high ceilings and large windows, along with wooden floors, ceilings and walls. The homes total 290 square feet (27 square metres), which includes the sleeping loft. 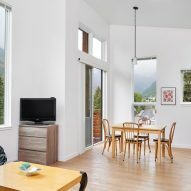 Rental prices at Virginia Placer are notably low for Telluride, where on average it costs $1,560 (£1195) per month to rent a bedroom, according to the Colorado Sun. At the new complex, monthly apartment rates are $850 to $1430 (£650 to £1095), while the tiny homes go for $700 (£535). The tenants are chosen through a lottery system. The monthly rate at the boarding house is $385 per person (£295). 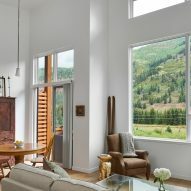 Aesthetically, the Virginia Placer development is meant to emulate the "high-end design" seen throughout Telluride. 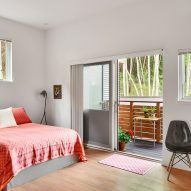 "A balance was struck between affordability and sustainability with passive solar and ventilation, maintenance-free materials, and design in this new neighbourhood a short walk from downtown," the team said. 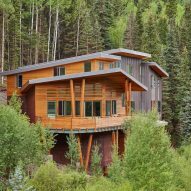 Founded nearly four decades ago, Charles Cunniffe Architects has designed numerous projects in Colorado, including an Aspen treehouse with vertical wooden slats and translucent panels. Photography is by Dallas & Harris Photography.